Working predominantly in ceramics, I am permanently running the gauntlet of my work being damaged. Not just in it’s final glazed state but in the numerous stages it takes to get there. The malleability of the still-wet slip as I remove it from the mould threatens to deflate and collapse. 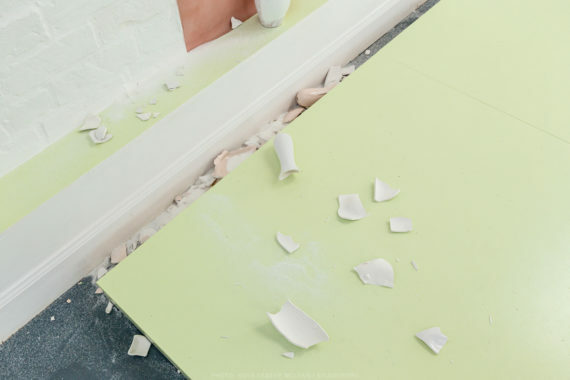 The clay must then completely dry out but if it does so too quickly it can shatter. 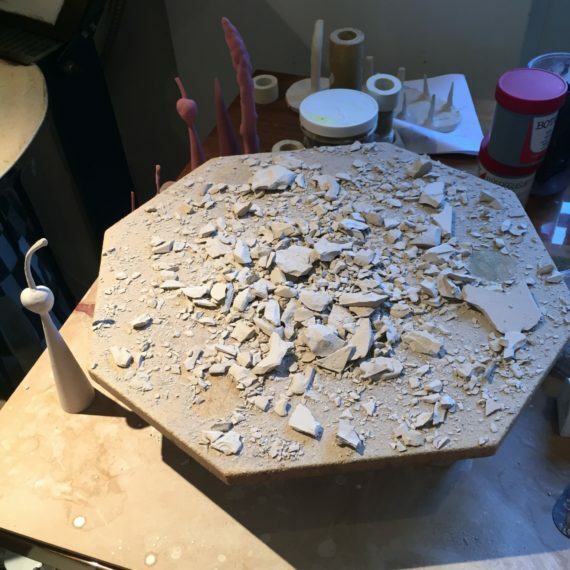 If it makes it to the first firing after these tentative initial stages, a trace of moisture or plaster will cause the object to explode in the kiln. In for the final glaze firing the work levitates precariously on props to prevent it from sticking to the kiln shelf, with the slightest wobble the pieces will fall from their stilts and congeal together. The process is an ongoing pull and push between controlling the destructive impulse of clay and letting its unruliness just be, deciding which mistakes are happy and trying to realign those that I deem not. While I incorporate and even encourage these ongoing mishaps that clay throws up, I never want them to entirely break and often have to abandon work when it is. They may bend and slump but the shiny lacquer of glaze emphasises their defects, and acts like a seal against further blows. They stand proud not fragile, still aspiring just falling slightly short. The title Made to be Broken seems then to belie the time and patience I spend preventing exactly what it is claims to be. It also goes against the endless hours Aniela spends training with the martial artist Jamie Robson and meticulously choreographing the performance so that both their bodies and my work remain unbroken. After all this hard work however there is a perverse satisfaction in seeing Aniela and Jamie’s politeness to the sculpture and each other give way, flirting with relinquishing some of this discipline and letting things break. The stage upon which the Made to be Broken installation and the performance is set is small and littered with a slalom of low-lying ceramic bowling balls and pins. With every bout the aggression of Jamie and Aniela’s interaction intensifies and the space between bodies and ceramics becomes ever narrower. As they kick and lunge limbs skate over the sculpture threatening to finally take them down but they remain stoic. I wince with every close shave, wondering how much more I can take of their fraught fighting. The repetitious movement slows and jars but as Jamie leaves the stage nothing has yet broken. My eyes fall to the ruching of Aniela’s boxing shorts expanding and contracting with each of her heaving breaths. Standing centre stage the focus is on the body as an instrument as it slowly steadies and repairs itself. Finally, with relatively little ceremony Aniela smashes a pin against the wall, striding out of the space clenching it’s decapitated head. They were after all Made to be Broken, not inadvertently knocked in the throws of the fight but with purpose and steel. Crisp curved shards litter the stage, like a broken easter egg. For the first time I am happy to see my work in pieces, perhaps because it is the destruction we (rather than the kiln) designed. 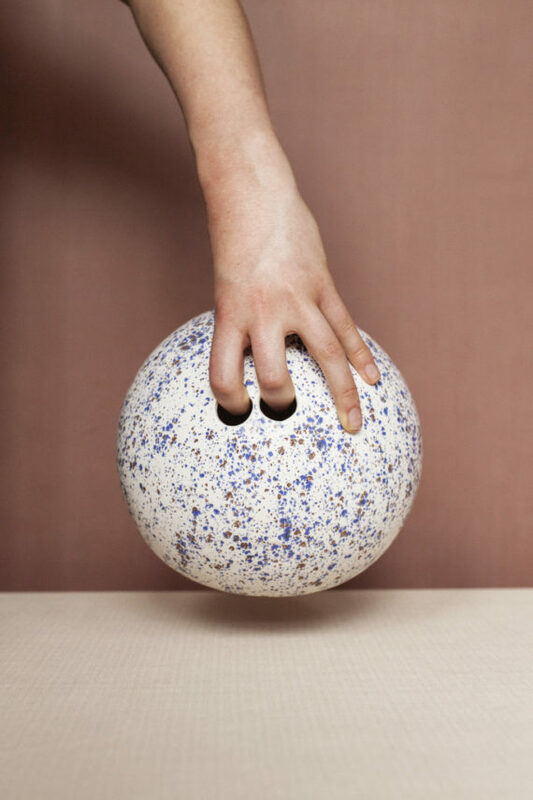 I like the way the ceramic smithereens serve to accent the serenity of the still unbroken works. I am only jealous that I couldn’t be the executioner. Paloma Proudfoot (born 1992, London) and Aniela Piasecka (born 1992, Glasgow) live and work between Edinburgh and London. They began working together whilst studying at Edinburgh College of Art and the University of Edinburgh respectively. 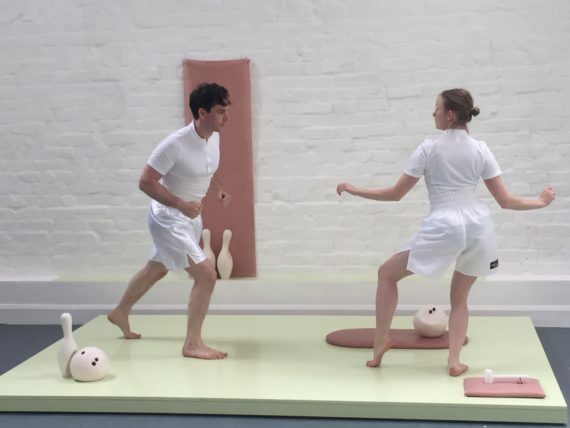 Their most recent installation and performance The Jockey showed at Edinburgh Sculpture Workshop, Edinburgh / Bloc Projects, Sheffield / Union Street Studios, London / BYOB presented by LUX, London / Buzzcut Festival, Glasgow (2015/16). They are co-artistic directors of performance group Stasis whose most recent work was featured at Glasgow International Festival for Marvin Gaye Chetwynd's opening event Mega Hammer and Zoe Walker and Neil Bromwich's Circus Between Worlds.